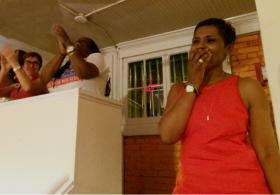 Valarie Wilson speaks to supporters Tuesday at her Decatur headquarters. While the state schools superintendent race on the Republican side remains too close to call, Democrats have their candidate. By a vote of 54 percent to 46 percent, former Decatur school board chief Valarie Wilson scored a decisive win Tuesday night over state Rep. Alisha Thomas Morgan. Wilson rode a wave of support from Democrats who were deeply uncomfortable with her opponent’s openness to charter schools and other school choice options. Speaking at her Decatur headquarters, Wilson told about 100 supporters public education needs to be protected and strengthened. “We’ve got to make sure that people understand what they’re doing to our public education system and then we’ve got to all go out together and fight for it,” said Wilson. Wilson will have her work cut out for her. Georgia is still an overwhelmingly red state. No Democrat has won statewide office in years. Wilson says her emphasis will be on policy, not politics. She says that’s what Republican members of the Georgia School Boards Association saw in her when they selected her to head the organization in 2012. “They knew I was a Democrat. They knew who I was. But they elected me anyway because they know that I’m laser-focused on what’s best for kids and I’m not bringing any of the politics into it,” said Wilson. Still, Wilson has taken positions highly unpopular in conservative circles. She’s an unapologetic supporter of Common Core. And she opposes a state tax break for those underwriting private school tuition. Wilson will face the winner of the Republican primary – either Mike Buck or Richard Woods – but that race remains a virtual tie.